Cover image which makes the book look quite scary although it isn't really. Jig, the gobin, is old enough to be a warrior but his poor eyesight sees him relegated to muck duty. He is more or less okay with this because between adventuring heroes, trolls and poisonous lizard fish, goblin warriors have the life expectancy of a frog in a blender. However, when he stumbles on a band of adventurers in the tunnels near the goblin lair Jig finds himself a part of their quest to slay a dragon and find the mysterious and powerful Rod of Creation. Along the way Jig devotes himself to the forgotten god, Shadow Star, befriends a young Elven thief and discovers courage he never knew he had. Goblin Quest is a fun romp which reminded me a little of the early novels of Terry Pratchett. It will be much funnier to fantasy fans and tabletop roleplaying gamers, who will appreciate things like the dwarven scholar's obsession with mapping out every tile of the tunnels as they travel, the assumption that all thieves know how to check for traps and Jig's continual surprise at the way the adventurers survive encounters where the odds seem stacked against them. 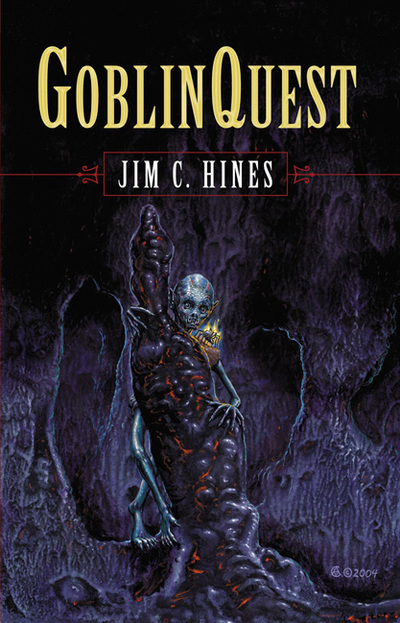 Goblin Quest is Hines' first novel, and it's a very promising start. You can get the first chapter for free here. If you like it you are in luck because there are two sequels, Goblin Hero and Goblin War, and an anthology of short stories called Goblin Tales.